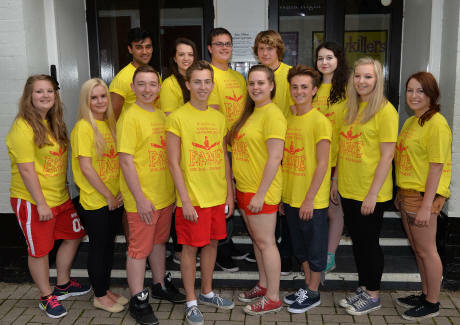 The entire cast of Rugby Theatre’s Youth Project show Fame. Picture by Martin Pulley. PREPARATIONS for the 18th Rugby Theatre Youth Project show have begun. Over the past week and the coming seven days this group of youngsters aged from 10 to 21-years-old will put together their version of the hit 1980's film and television series Fame from beginning to end. They have taken charge of all areas both on and off the stage with help from theatre stalwarts headed up by resources director Phil Kettle, show director Janet Devenish, musical director Jonathan Rees and choreographer Graeme Henderson. Fame follows the final class of New York City’s celebrated world famous High School for the Performing Arts on 46th Street from their 1980 admission when young talented hopefuls undertake the journey of their lives, through to their 1984 graduation. All of the struggles, triumphs, and fears of students and teachers alike are depicted with razor-sharp wit and memorable tunes. It has enjoyed seven West End runs since premiering in the USA in 1988 and continues to be performed all over the world, most recently at The Belgrade in Coventry. 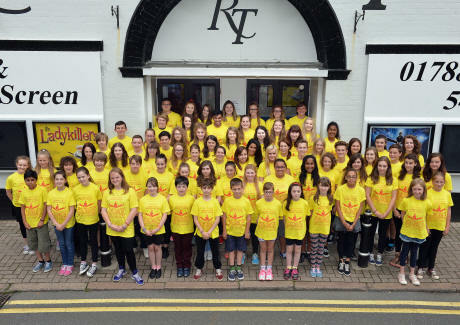 And Rugby Theatre Youth Project's version mirrors the original as many are, or will be, following similar paths to their on stage characters by studying musical theatre or drama with hopes of careers in the spotlight. Fame will be performed from July 30 to August 1 at 7.30pm and on August 2 and 3 at 3pm. Tickets can be booked on-line at rugbytheatre.co.uk or by telephoning 01788 541234. - Rebecca Shaw, who stars as dance teacher Miss Bell, is a Youth Project débutante, but has appeared on the Rugby Theatre stage before in A Midsummer Nights Dream in May and has just finished her second year at Stratford college studying musical theatre. - Georgie Blacker will share the role of English teacher Miss Sherman. She is 19 and this will be her second appearance after playing a lead in Footloose last year. She will be starting a degree at the London College of Music/West London University in September studying music management. - Dani Boughey, who also plays Miss Sherman, is appearing for a sixth year and was aged just 10 first time around. She is currently studying theatre and performance studies at Warwick University. - Georgia Anderson will play Carmen Diaz, having just completed the performing arts course at Rugby College. The 18-year-old is going on to do a foundation course in musical theatre in September. - Faye Wallace was handed the part of ballet dancer Iris Kelly at the last minute after the original cast member had to drop out. The dance teacher is a theatre regular having previously appeared in The Importance of Being Earnest and a Midsummer Night’s Dream, and will play Nicky in Shakers in November. - Daniel Singleton, a 17-year-old performing arts student, will play Goodman (Goody) King. - Teddy Moynihan takes on the role of Joe Vegas in what is his eighth Youth Project. Aged 19, he is at Arts Educational Schools in London on a scholarship doing a degree in musical theatre. - Matthew Russell, who stars as Nick Piazza, is also a regular, having appeared in the last three year's shows, and is currently studying at Tring Park School for Performing Arts. - Harry Sheasby hopes his part of Schlomo Metzenbaum will be the next stepping stone to a career on stage. He is just 15 but has already trodden the Rugby boards, first starring there in Oliver in 2007 at the age of seven. In September he will begin at Birmingham Ormiston Academy in September where he will study musical theatre. - Tanveer Devgun, 19, will play Tyrone Jackson. He has been part of the Youth Project for eight years now and has also performed professionally in Jungle Book and for the BBC Proms. He will be studying BA Hons in Dance at Liverpool Institute of Performing Arts (LIPA) from September. Fame’s principal cast. Picture by Martin Pulley.